Electrical or Mechanical Engineering qualified candidates are eligible to apply online for this Madhya Pradesh Professional Examination Board Recruitment 2018. For MPPEB Group 3 Sub Engineer Recruitment 2018 candidates must be a Engineering/Technology Graduate or polytechnic diploma. For MPPEB Group 3 Draughtsman Jobs candidates must have completed ITI Draughtsman or Diploma in Civil Engineering. Total 557 vacancies are in this MPPEB Group 3 Sub Engineer Recruitment 2018. MPPEB is recruiting this SE Civil/Electrical/Mechanical jobs to fill the available vacancies in Group 3 cadre of Madhya Pradesh State. Selection for MPPEB Group 3 Sub Engineer Vacancy Recruitment will be through Written Test and interview. Last date for online application form submission for this MPPEB Group 3 Sub Engineer Civil/Electrical/Mechanical Jobs is 10-08-2018. 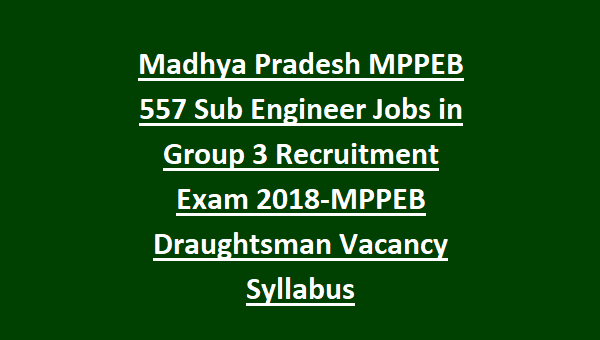 For more details regarding Madhya Pradesh PEB Group 3 Sub Engineers Jobs vacancies, selection process, pay scale, application fee, qualification, Exam Pattern, Exam Syllabus, age limits, online application process and more details are given below. Vacancy Notification For MPPEB Draughtsman, Sub Engineer Jobs in Group 3 Cadre. 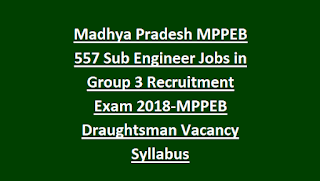 There are total 598 Group 3 Sub Engineer vacancies available in this Madhya Pradesh PEB latest govt jobs recruitment of MPPEB Government Group 3 of Technical Education Dept. For Group 3 Sub Engineer Jobs in MP candidates have completed B.E or B.Tech in Electrical or Civil or Mechanical engineer or Polytechnic Diploma in Civil or Electrical or Mechanical Engineering. Pay Scale is applicable as per group 3 cadre posts. For OBC/General Candidates Application/Exam fee is Rs.500/- and other charges are applicable as per the norms. For SC/ST candidates Rs.250/- application fee. The selection for MPPEB Sub Engineer and Draughtsman Jobs is through objective type written exam which will be conducted for 200 marks. Written Exam qualified candidates only eligible for personal interview based on merit in exam. Written Exam is consist of 200 questions. To test the candidates knowledge MPPEB may ask your Degree Engineering syllabus questions. MPPEB Group 3 posts online form submission will starts from 27-07-2018 and last date is 10-08-2018. 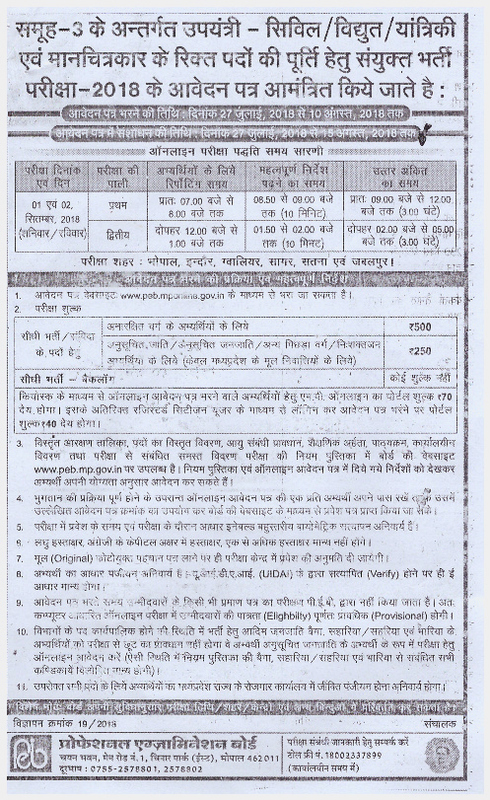 Submit application form online through MPPEB official website of @www.peb.mp.gov.in.